WE ARE CLOSED FOR BUSINESS. Apologies for the inconvenience. Thanks very much to all our guests that booked their pets with us, we will miss you all dearly. Our guesthouse is exclusively for indoor companions. You will see loads of boarding options in stacked hutches outdoors and even indoors. That is not what we do, our aim is to make sure your indoor companion has a safe, warm and homely environment with enough space to roam, and get lots of attention and pampering while on their relaxing break with us. We have a room in our home with two suites dedicated for our little guests. We have an additional suite in our lounge. We do not have either dogs or cats in our home and we do not have children. As you can imagine with just three suites, spaces are limited and we strictly operate on a first come first serve basis only, so please contact us ahead to check availability. To confirm your booking with us, you will need to fill in a booking form electronically with as much detail as possible of their daily routine, diet etc and send us a 50% non-refundable deposit. As we stated above, we do not take in outdoor rabbits or encourage the habit of people having rabbits in 'solitary confinement' locked away in a hutch at the end of a garden. Each and every rabbit we have cared for has their own unique personality. And just like dogs or cats, you can develop their personality by sharing your home with them, spending time with them and caring for them like they're part of the family. Rabbits confined outside are often forgotten and neglected. Life confined in a hutch is boring, depressing, dangerous and stressful, it is detrimental to health and happiness, just like it would be for any person. You will develop a deeper connection and relationship with your bunny when you live with him. Rabbits can be fully incorporated into family life, just like dogs and cats. For rabbits and guinea pigs, we have two suites, the Meadow suite and the Orchard suite. Each suite consists of a large cage (dimensions:L95 x W57 x H46 cm) with a secure enclosure around the cage. For bunnies, I usually leave their cage open 24/7 so they can access their own enclosure at all times (unless specified otherwise). We aim to give as much individual attention and care to our guests and hence we only board two pairs of rabbits / guinea pigs at a time. We also accept other small animals i.e. hamsters, gerbils, rats, chinchillas, degus in their own cages. We will provide litter/bedding, timothy hay, fresh greens and water daily. They have access to their own secure enclosures at all times for exercise and play. We aim to spend as much quality time as possible with our guests. Please feel free to bring along their toys or items they love (if you can) so they feel more at home with us! We can only take rabbits that are vaccinated against Myxomatosis & RHD 1 & 2 (Rabbit Haemorrhagic Disease). You have to bring proof of your rabbit’s vaccination with you, we will not accept your bunny/ies without this on arrival. We use plastic cages as these are more hygienic than the wooden ones. Cages cleaned regularly. It is essential that you declare any current / previous illnesses that your pet has / had on our booking form so we are aware and prepared for any situation that might occur while you are away. Unfortunately we do not board ferrets. In order to secure your booking, we will require a 50% non-refundable deposit once availability is confirmed. The remaining 50% is payable upon arrival. For the deposit: we accept cash, Paypal and bank transfer. Large pen for my rabbit as opposed to a tiny corner, clean and spacious. It's a very nice setting and my rabbit is always happy when I take him back home A great deal of care and love. Also appreciate the updates as an anxious rabbit mum. Highly recommended! We are so glad that we chose The Littlest Guesthouse to look after our two bunnies, Indy and Peanut. Rachael took excellent care of them and she even stayed up to make sure Indy was eating after an upset stomach! We received lots of updates, pictures and videos of them, which were truly reassuring. The pricing is also very reasonable, and I would definitely use them again! Overall, the buns had a great little holiday and our experience was surprisingly stress-free! A lovely and clean enclosure for our rabbit Elsa where she was provided with entertainment to keep her busy! We felt reassured knowing she was in very good hands and received daily updates. Overall a wonderful service, thank you. We would highly recommend using the littlest guesthouse! We've just collected our bunnies from their first stay and straight away on arrival we knew they'd be well looked after - we didn't feel nervous leaving them there at all. They had a lovely, clean hutch and space to hop around outside it. Although they were visibly nervous at first, the photo updates we received showed that theyâ€™d settled in very well and obviously felt happy and safe there. When we collected them they were happily munching away on their hay. Rachael was brilliant throughout and even put multiple fans on for our buns to help them deal with current heat wave! we will certainly continue to use them! We would like to say thank you to Rachael for looking after Bubbles & Spots. We had gone to Tenerife for 10 days and it was a great help, the cage was cleaned they were provided with some extra toys and came back very happy. The Littlest Guesthouse sends you photos as well which we really enjoyed and we will definitely be returning again. This is reccomended greatly by us, thanks again! I was really happy leaving my two bunnies with Rachael for a recent trip away. It's the first time we have used The Littlest Guesthouse and couldn't be more pleased with the service! You can tell Rachael really cares about your pets and it was really nice to see pictures of them daily and also seeing some videos of her playing with them so I knew they were well looked after. Snickers & Mabel came back from their stay very relaxed and happy which made me feel extremely comfortable - so much so, they will be returning to The Littlest Guesthouse in a few weeks' time! Had my bun stay at The Littlest Guest House for bank holiday weekend. Lovely people in a nice area where my bun had lots of space. They took into account his usual routine and see sent me photos and updates while I was away. They were flexible with drop off and pick up and quick at replying. Will definitely be bringing him back next time! I am so happy that I found such an amazing family and place for my bunny when I am away . My bunny loves his luxury 7 stars ðŸŒŸ hotel too . They look after him as a mum does . Rachael was very quick to respond and very nice! I boarded my little Syrian hamster with her for 3 weeks and my hamster got along with her very well. She sent me photos and updates every other day. She has a room just for bunnies and a room for small rodents in individual cages. It's very clean and she left our hammy with a lot of wood shavings to burrow under :) I would definitely use her in the future. Rachael is worth more than 5 stars I wish I could give her more. She took excellent care of my beautiful bunny for around 25 days while we were abroad. The whole process from start to finish was amazing and extremely professional. She even took the time to send us updates and pictures whilst we were away. I 100% recommend using Rachael and I will be definitely using her services again in the future. Thank you for taking such good care of Rufus. Cara & Bella, our two Netherland Dwarf bunnies, were well cared for during their visit. I loved getting regular pictures of them. It reassured me they were safe and cared for. I greatly appreciated the pick up/ drop off service offered. The girls were safely secured in the back seat of the car in their separate carriers. Filling out the information form about the girls and their routines was great. Again this reassured me their routines would be kept to as best as possible by Rachael. Having most of their food (hay etc) included in the price was helpful. I regret not asking how much space the girls would have to run around - I had just bought them new toys they loved but I didn't send them with them as I thought they would be too big for the spaces. After seeing some pictures I was delighted to see they had loads of space but I felt guilty I didn't send their new toys with them. Rachael actually had some toys similar to what I had just bought them so they seemed quite happy in the pictures. Overall, very happy with the service. The girls settled in home really quickly which is a good sign that they weren't overly scared by anything. Rachael is super sweet, friendly and caring. Very much recommend The Littlest Guesthouse. Rachael is very organised and welcoming, and we felt that our hamster was very well cared for. Thank you! We researched so many rabbit boarding and we found this to be the best! Chubby Bunny and NoÃ«l had their own open cage to run around freely as they would at home and had toys to play with. Every couple of days we received an update with how they are both doing. I would definitely recommend The Littlest Guest House as they were so welcoming and accommodating to the bunnies needs. They looked like very happy bunnies, thank you! My little Robo hamster Tiny went on his first ever holiday over the Easter weekend and was very well looked after! Rachael is very friendly, you can tell she cares about her little guests, and she even managed to get a video of my little guy running on his exercise wheel. I highly recommend The Littlest Guesthouse! It is the first time ever that we're leaving our netherland dwarf bunny with someone else for 2 whole weeks, but we're glad to have found The Littlest Guesthouse! Harvey was very well looked after and we were very pleased to know that he was running around different places (a sign that he settled in well enough to be curious). This is going to be Harvey's second home now :) Thanks for everything again! Lovely to have a rabbit boarder who actually keeps them inside their house! My rabbit benji seemed to have a great time, got lots of fuss and space to roam free. I was kept fully informed of how he was doing. Without doubt I will be using the service again. We felt totally at ease as soon as we walked in to The Littlest Guesthouse, the room where Tinka stayed was clean, warm and cosy. I was a bit apprehensive leaving her with someone new as she's 10 years old and needs daily medication for arthritis but Rachel calmed my fears and had no problems whatsoever giving the medication. Great job, thank you Rachel! Was great to know that our mini-lop Chewie was well looked after during his 3 night stay at The Littlest Guesthouse. Receiving regular updates and photos really helped put our mind at ease and relax during our time away. Great service, will be using again in the future. Brilliant! They looked after our pet Hamster whilst we were on holiday, providing him with excellent care and chatting daily with my 8 year old daughter on WhatsApp, sending her photos and videos of her beloved pet. Will definitely be using this service again and thoroughly recommend it to others. Thank you to The Littlest Guesthouse for taking care of my little Dori, she's a nervous bunny with new people and Rachael took extra care, time & attention plus I got lots of updates. An excellent clean and loving boarding place which is a home away from home for bunnies. Our rabbit Poppy had a great stay at The Littlest guesthouse. We were really happy with communication while we were away and the updates with pictures! She was well cared for and we couldn't recommend enough. We will be using again when we go away. Our precious bun Snowball stayed here for 3 days and as it was his first time at boarding, we were unsure about what to expect. However, Rachael looked after him like a pro and kept us updated with daily pictures. The suites are spacious and perfect for an indoor bunny who's used to free roaming. I also love it's only small furries here so no worries about cats/dogs. Highly recommend this place and actually look forward to boarding here again! I have a gerbil and 2 guinea pigs and Rachel took very good care of them. I totally recommend them. Thanks a lot for the spot on service. Impressive! Great service. Rachael sent me regular pictures to let me know how my two rabbits were settling in. Would highly recommend. Thanks Rachael. I left my guineas with Rachael for 2 weeks while we were on holiday and they seemed to have a good time! I also really liked getting pictures of them every few days - a nice touch. Thank you again Rachel! Archie had a lovely time weekend! Very attentive carers! I left two hamsters with Rachael last minute! I also received regular photos via whatsapp. Great service from The Littlest Guesthouse from booking enquiry to collection. Responses to questions have been really quick. The update photos from while we were away were much appreciated as well. It's clear that they care about the animals that are staying with them. Next time we go away hopefully they will have space for our gerbils again. Thank you. To anyone else I would highly recommend Rachel's littlest guest house. Your pet will be well cared for and have a super time. She really loves little pets. Mussels had a good time and I enclose a photo of him helping me uppack !!! Penny has stayed at The Littlest Guesthouse twice now and has had a fantastic time both times - she never wants to come back home with me! Rachael and Tristan are both clearly animal lovers and Penny has been very well looked after each time, thank you! Had an absolutely amazing experience with "The Littlest Guesthouse". My hamster was cared for perfectly and I've got nothing bad to say about the experience. Would certainly recommend and use again! Thank you so much for taking care of my 2 gerbils for a whole month. You have made me feel so at ease, with replying to emails straight away and letting me know how they were doing with photos. I will 100% be using your services again. Thank you. I always leave my pet rabbit, Bobbi, at The Littlest Guesthouse whenever I go away. She's always well looked after in a safe and secure environment - and I get lovely photo updates! Thank you so much to The Littlest Guesthouse. Rosie our pet rabbit immediately felt at home. She was loved and cared for during her entire visit. Rachael was attentive and thorough and I would highly recommend them! I found the Littlest Guesthouse a great place to leave my bunny. It provided a spacious and secure enclosure with plenty of hay and toys, and I was also given updates and any queries were quickly answered. I would definitely use again in the future. I am really happy with the service that I recieved at the littleguest house. I felt safe in the knowledge that both my rabbits would be well cared for and I felt that I could enjoy my holiday knowing that they would be taken care of. 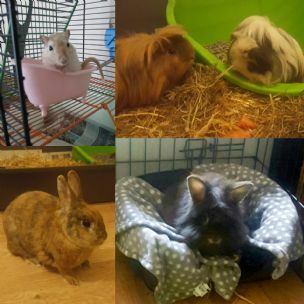 I would recommend the littleguest house because all information regarding care of rabbits is taken into account and procedures are followed, for example ensuring that your rabbits have been vacinated, appointments are kept and not cancelled, and it was lovely receiving pictures of my rabbits. I will continue to use the littleguest house. Having never used pet boarding before I was reticent and unsure. Found this option and made contact. I was reassured by fast and comprehensive responses. On dropping off my pet I realised I had nothing to worry about. My pet's hosts were caring, sensitive and very clearly 'animal people'. I cannot express how reassured and comfortable they made me feel. I returned a fortnight later to find my pet healthy, happy and spoiled rotten - exactly what he was used to. Great service and I will not hesitate to use them again. I can't recommend them highly enough. We are based in Colindale, zone 4.